Antique Indian Silver Jewelry is one hundred years old or older according to the Antique Guild and the trade. Vintage Indian Silver Jewelry is Indian Silver Jewelry that is 25 years old or older. So, with this being said Antique Indian Silver Jewelry is Indian Silver Jewelry that was made prior to 1911 which is 100 years ago when this document was written. John and Estell Hartman of Durango Silver began collecting Antique Indian Jewelry in the 1960's as Johns best friend was a Taos Indian. Steve, John and Estell would goes to all the Antique Shops, Flea Markets and Garage Sales hunting for Antique Indian Silver Jewelry. John and Estell collected and kept most all of the Antique Indian Silver Jewelry treasures they found while Steve made a business selling his antique Indian Silver pieces. John and Estell amassed an incredible collection of antique Indian Silver Bracelets, antique turquoise silver rings, antique turquoise earrings, antique turquoise and silver necklaces and all antique Indian Silver Jewelry items of high quality that they could find. By the 1970's, John and Estell has become Silversmiths which started to fix the broken antique Indian Silver Jewelry and then stone cutters to replace the broke or missing stones in the antique Indian silver jewelry. John and Estell started taking their Silver Jewelry to different areas in the Rocky Mountain regions from the Grand Canyon area all the way up through the Yellowstone area. The entire time they were traveling they kept on hunting and purchasing antique Indian silver jewelry. In the mid 1970's, John and Estell had been selling a lot of their Silver Jewelry as well as Native American Indian Silver and Turquoise Jewelry to Red Kelly who owned Keeley's Trading Post, which was located in the Buffalo Bill Historical Center in Cody, Wyoming. The Buffalo Bill Historical Center had a lot of money and was buying anything of great historical value from the Western Frontier years and John mentioned his collection to Red. Red told the curator of the Buffalo Bill Historical Museum about the collection and ultimately they purchased the entire collection of Antique Indian Silver Jewelry form John and Estell for a huge amount of money that was so large John and Estell could not refuse to sell the collection. John and Estell went on to be the largest antique Indian Silver Jewelry buyers in the Western United States for many years. In the late 1970's, the Santa Fe scene took notice of Antique Indian Silver Jewelry and soon the hay day for John and Estell ended as thousands of individual's began scouring the country for antique Indian silver jewelry and antique Indian silver turquoise jewelry. 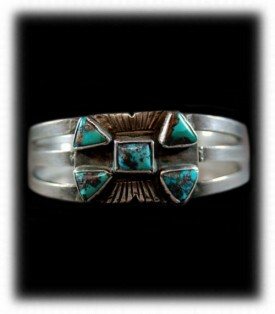 Today, John and Estell still offer a small amount of Antique Indian Silver Jewelry and Antique Indian Turquoise and Silver Jewelry at their historic Trading Post in Durango, Colorado as well as their web site located at DurangoSilver.com. John and Estell continue to buy antique Indian Silver Jewelry collections and even individual pieces of antique Indian Jewelry as they find it, however, true Antique American Indian Jewelry has become very scarce and it has also been copied and reproduced to look old by many individuals, mainly to sell to the Santa Fe market. If you have Antique Indian Silver Jewelry and/or Antique Indian Silver and Turquoise Jewelry, we are buyers and we would like to have a chance at purchasing your collection. Please email photos of your Antique Indian Silver Jewelry along with any information you have on the items to John@DurangoSilver.com. 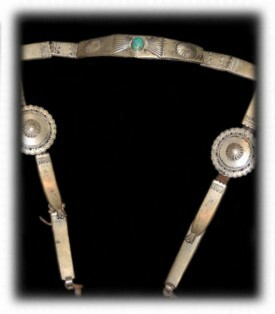 Above is a beautiful antique Navajo Indian handmade Silver Concho Belt, made from coin Silver. Each Silver piece is slightly different in thickness which tells us the the Silver was pounded out from Silver ingots that were poured from molten Silver. This piece of Antique Indian Silver Jewelry is a great example of a American Indian Silver Concho Belt that was made prior to 1911, which makes this piece an antique. To the left is a is a wonderful heavy Antique Navajo Silver Necklace made with hand stamped bench made beads and a heavy tufa cast Naja with the same stamps. This piece was most likely made prior to 1911 as it is very heavy and made with coin Silver. It is an exceptional piece of Antique Navajo Jewelry that is a great example of early Navajo Silverwork. To the right is a Antique Ingot Silver Men's Turquoise Cuff Bracelet. This is an outstanding Navajo Ingot Bracelet that was made in the early 1900's and probably around 1910. It is very heavy with exceptional silverwork. It has an old Turquoise stone, probably from Nevada and was made from coin silver. The metal has silvered out inside which is what seasoned Indian Jewelry collectors look for and has been in a prominent Indian Traders collection for over 75 years. 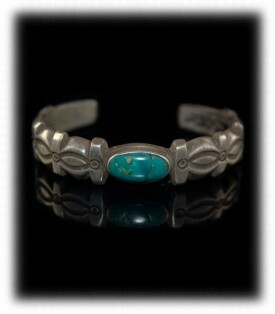 This is a very rare Antique Navajo Turquoise Bracelet that is truly a one of a kind piece. 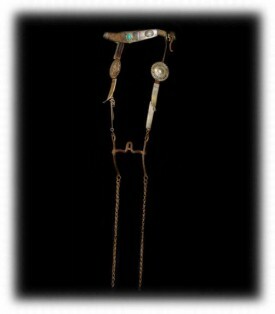 This is truly a great old Navajo Bridle that I purchased from Jim and Carol Porter, past owners of Chilchimbito and Tsegi Trading Posts. I purchased this myself, John Hartman), in 1984 from Jim and Carol when they lived in Bluff, Utah. The Trading Post had been closed for several years when I purchased the balance of the Indian and old west collection from them. I have several other items from them like their antique furniture, Trading Post Rugs with Tsegi on them and more. See the Chilchimbito story. 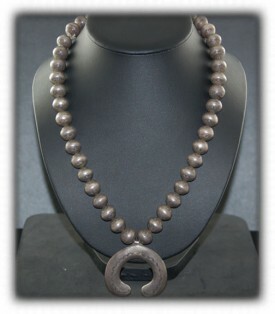 This is a great historic piece of Antique Indian Silver Jewelry. To the left is a classic Antique Navajo Indian Silver Bracelet from about 1910. This Antique Silver Bracelet was made from coin Silver that was melted and poured into ingots, pounded into sheet and then the Silver was tooled than two pieces were then forged together in an open fire with the use of bellows to heat the silver fire red. The bezels we forged onto the bracelet frame in the same manor. 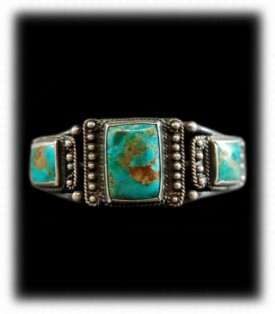 This is an early example of Antique Turquoise Indian Silver Jewelry from the antique period. To the right is a great piece of Vintage Indian Silver Jewelry which is old, but, it is not antique. This particular Indian Silver Bracelet was made about 1930 - 40, it was made from Sterling Silver sheet and wire that was purchased from an Indian Trading Post. It is truly a beautiful piece of Indian Silver Jewelry, however, it is not an antique. It takes a trained eye of a educated person in this field to detect true Antique Indian Silver Jewelry. John Hartman of Durango Silver Company is one of few who knows Antique Indian Silver Jewelry from his vast past experience of being an Indian Trader for the past forty years. Again, If you have Antique Indian Silver Jewelry and/or Antique Indian Silver and Turquoise Jewelry, we are buyers and we would like to have a chance at purchasing your collection. Please email photos of your Antique Indian Silver Jewelry along with any information you have on the items to John@DurangoSilver.com. We hope you have gained some useful knowledge from our Antique Indian Silver Jewelry educational presentation page. We invite you to learn more about Silver Jewelry, Indian Jewelry and Turquoise Jewelry by following the links in our Learning Center which has many other informational pages that we have written on topics related to Southwestern Silver Jewelry. In addition, we would like to invite you to join our E-Mail Newsletter - about once every other month we send out a Newsletter to inform our members of what's happening with Durango Silver Company, new products, specials for our members and more. We also have a monthly drawing from our members to Giveaway free Turquoise Jewelry from our company. Please take a moment to become one of our friends and future winners in our giveaway by signing in below.